Drove to Cameron yesterday, it’s about 35 minutes north, the nearest town to the park. It’s mainly a trading post/restaurant/motel and some nearby Navajo/Native American shops on a dusty stretch of Highway 89, on the way to the Grand Canyon and far northern Arizona. I had the Navajo taco, which turned out to be huge. Basically a taco with lots of beans on an enormous flat “fry bread”. I did what many visitors did and ate mainly the inside and left the large outside crust. It was very good and I was not hungry for a while. Driving back south there is a great view of the San Francisco peaks, an odd sight with snow at the top as you drive the lower altitude desert where it’s 91 degrees. 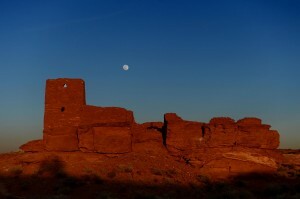 I went out to the Wukoki pueblo before sunset to photograph the almost full moon rising as the last rays of the sun hit the pueblo. At that time of day it’s quiet and cooling down and the giant structure is quite impressive. Behind me high clouds turned various colors of red, pink, orange during the usual spectacular sunset. I ran around to the east side of the pueblo to try and catch this display, but was about 1 minute too late. It’s amazing how fast the sky changes as the sun goes down. Back in the parking lot of the apartment I see Jupiter and Venus setting in the west. Then I remembered there is a conjunction of Jupiter, Venus and Mercury happening over the next few days. I take out the binoculars and see Venus and a fainter Mercury to the right. 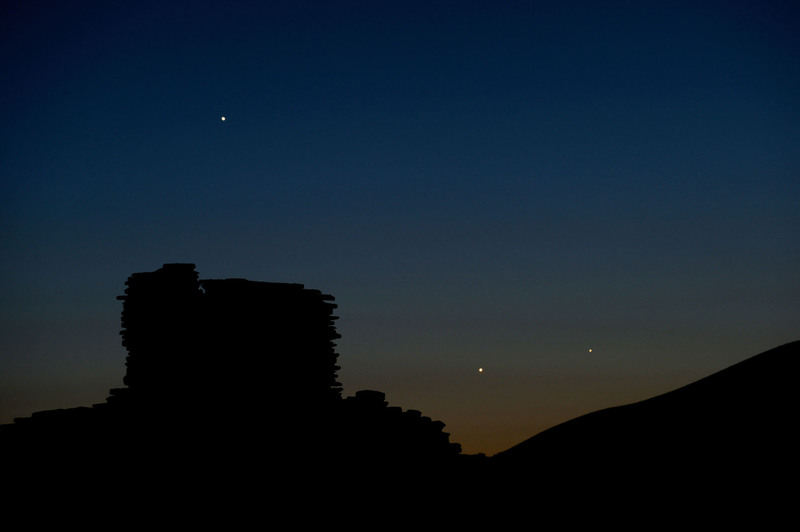 I get my camera and tripod and walk down to the Wupatki pueblo overlook and see the three planets in a large triangle formation set over the pueblo tower. It’s a really great sight especially since most of the time it’s very hard to see Mercury, usually lost in the sun’s glare. Here it’s very visible with your eye, a rare event. As good as the photo is, I think it might be better tomorrow when the planets are even closer together. Can’t wait.